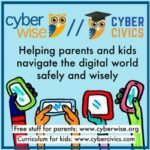 Recently we had the pleasure of meeting with Cyberwise, Frienedy and Author Melissa Schorr about ways parents can be back in control in their children’s lives. I could not get the Blab to work. i clicked “sign in with facebook” and nothing happened. It looks like it was temporarily down, but appears to be working now. If you still have trouble, let us know!